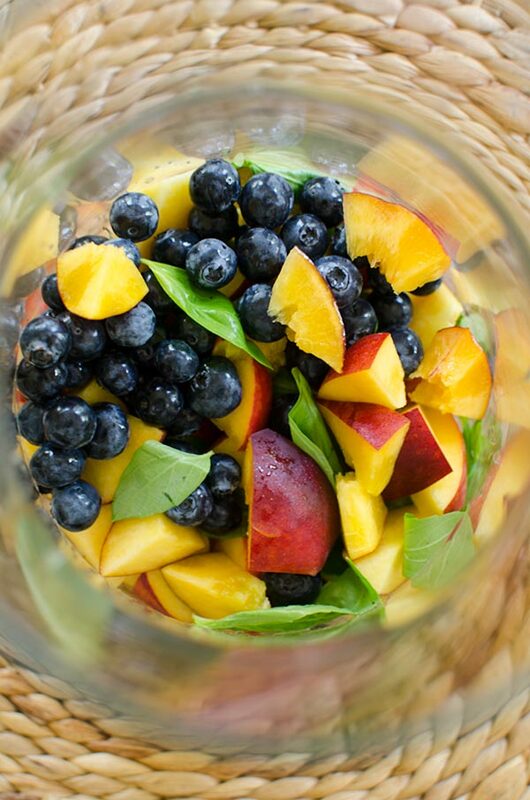 Whip up a quick peach sangria with blueberries, basil and rose for a crowd for a refreshing summer cocktail. Does anything scream summer more than a refreshing glass of sangria? I don’t think so! Every year, my summer bucket list always includes these three things; read X amount of books, go rollerblading, and make sangria. I usually check off two of those three items, but tend to forget about the sangria plans. We bring up bottles of wine and fruit to cottages with big plans for making pitchers of everyone’s favourite refreshing drink. Before you know it, the weekend is over, the bottles of wine are empty and you have no sangria to show for it. Weekends pass by way too quickly, especially when they are the laughter, sun and wine-soaked variety. I so enjoy these summer weekends. I’ve been really busy with work recently, so I feel like I haven’t quite been making the most of the summer yet but there are still two months to go! It’s tough to find that balance between getting everything done that I need to do and having downtime to do all those things that I want to do in the summer. I’ve been pretty good recently at making the most of my time during the week so that my weekends have a little more wiggle room, and the plan is to keep that up until September. With June being pretty much over and Canada Day and the Fourth of July coming up, summer is officially here (and positively zooming by). 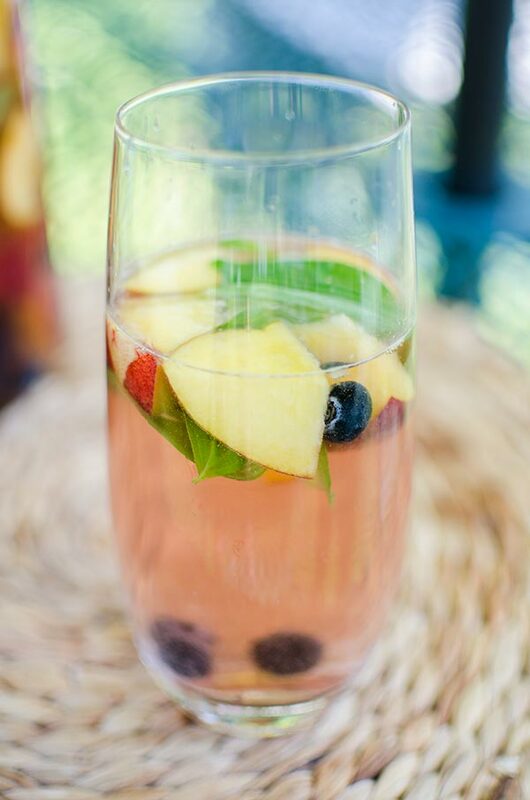 I developed this easy sangria recipe with peaches, blueberries, basil and a deliciously sweet rose wine with one of my best friend’s during one of the first beautiful Saturdays we had in June. We were hanging out in the backyard and decided that it was the perfect afternoon for sangria. After heading to the store to gather the ingredients, we mixed it all together and let it sit in the fridge for an hour to allow the fruit to infuse with wine. I’ll tell you, waiting that hour was so hard, but so worth it. While we opted to use rose for this sangria, you could definitely use a white wine in here as well. If you’re up at a cottage or just having a little getaway in your own backyard or on your tiny balcony, a pitcher of sangria is basically the best way to spend your afternoon. If you’re wondering how to make sangria, my recipe is as simple as mixing the fruits and flavourings of your choice, adding wine and seltzer water. Serve it over ice (tip: never add the ice to the pitcher because it will dilute the entire pitcher). If you’re looking for another perfect summer drink, you can try my blueberry vodka lemonade. Mix all ingredients together in a large pitcher. Refrigerate for an hour. 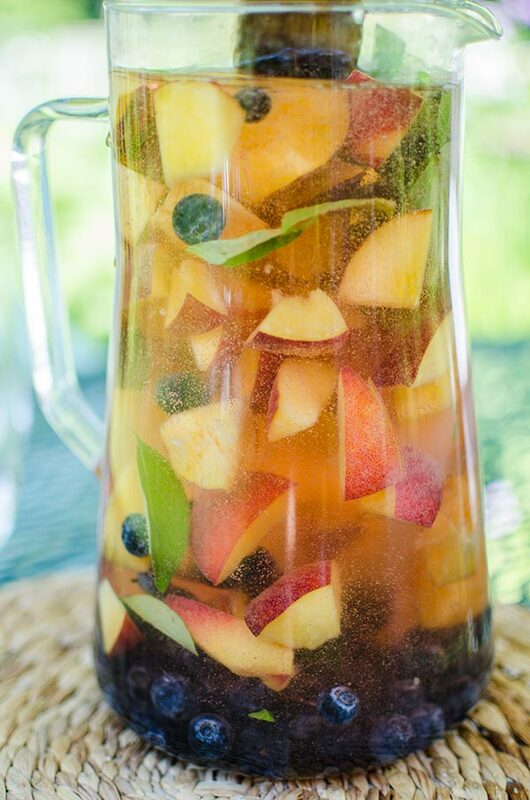 Let me know if you give this refreshing peach sangria a try in the comments below. OMG! This looks & sounds like the most delicious Sangria, EVER! And, "healthy" too! And, very "timely"! Thanks Nicole, I hope you liked it!